“[Huck] went inside with his dog and noticed the dog quickly ran towards the recreation room. The recreation room was closed and [Huck] could hear his wife’s I-Pad yoga application playing in the room so he knew she was still doing yoga but he could not see her. “Normally, he said she would come out and give the dog granola and nine blueberries for breakfast. Since she was still doing yoga, he went into the master bathroom and saw a bag filled with clothes that was not picked up by charity. He thought to himself that he needed to drop the clothes off that day and started getting ready to leave. He then saw an old package that he needed to mail out that day. It was a birthday gift for his nephew, which he needed to mail that day in order for it to make it in time for his nephew’s birthday. He completely forgot about the charity bag filled with clothes and was thinking how he had to go to the post office in Los Alamitos to drop off the package. The video below, taken into evidence by the LBPD on March 4, 2014, shows activity inside the house from 8:43 a.m. to 8:53 a.m. real time on the morning of March 3, 2014. Huck’s activities do not match what he told the police he was doing. No audio was recorded. NOTE: The time code on the video is 24 minutes ahead of real time. According to the video, Huck entered the house with the dog at time code 09:07. Huck wore sunglasses with attached Bluetooth earbuds, which covered his ears. He continued to wear the earbuds as he fed the dog a treat in the kitchen, removed his coat, and walked off camera. He reappeared on camera at 09:08:16, and walked down the hallway toward the yoga room. He returned with an armload of bedding. He covered the sofa with sheets and prepared a bed for the dog, as if planning to leave the dog at home alone. At 09:09:53, he pushed an orange chair toward the table, removed his earbuds/sunglasses, and walked off camera. He returned to the table at 09:11:19, put on a different pair of glasses, and checked his iPad. At 09:11:56, he turned off his iPad. He ran his fingers through his hair as he walked toward the center of the room. He groomed himself in a mirror on the wall. At 09:12:06, he turned and walked down the hallway toward the yoga room. The dog followed him. At 09:12:26, the dog walked from the hallway into the living area and settled onto the sofa. The dog appeared to startle at the sound of the alleged “loud crash” at time code 09:12:33. The dog looked in the direction of the hallway where Huck had gone. The dog did not move from the sofa. At 09:12:45, Huck walked from hallway into the living area, and appeared to be brushing his teeth. He went back down the hallway at 09:12:49. This was the last time that Huck appeared on camera until after the 911 call. The call to 911 was placed at 8:51 a.m., or 09:15 video time code. There is a discontinuity in the video at 09:14:26, and the recording resumes at 09:16:55. Despite many obvious discrepancies between Huck’s statement and the video evidence, homicide detectives portrayed Huck’s claims as truthful. Specifically, Detective Johnson stated in the search warrant that Huck could hear his wife’s iPad playing a yoga video in the recreation room — as if this was an established fact — despite Huck’s wearing earbuds at the time. Huck’s glasses with earbuds alongside State Farm life-insurance policy statements. 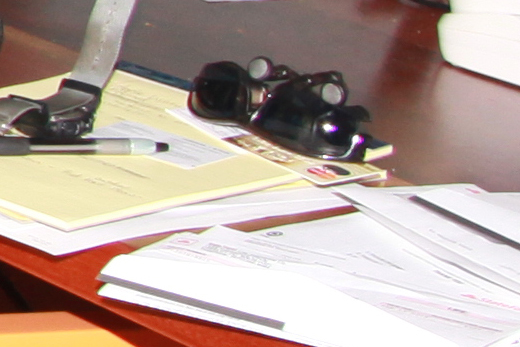 State Farm logos on documents near Huck’s computer. Detective Johnson described these events as matters of established fact when, clearly, the evidence contradicted these claims. As the surveillance video shows, Huck did not “check the surrounding yards.” Rather, he appeared to brush his teeth, and did not leave the house.